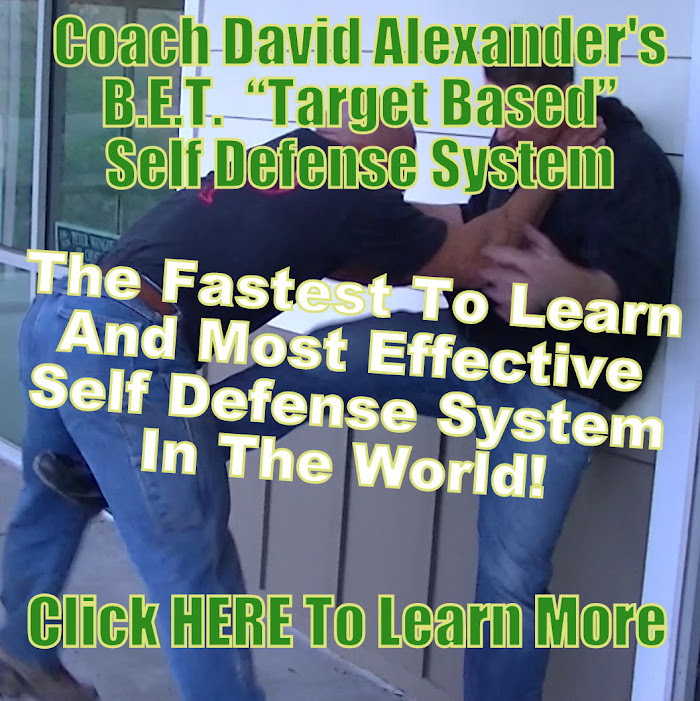 Learn to Fight at http://www.CoachDavidAlexander.com for Real Self Defense. WARNING! Don’t ever do this, you will kill someone!!! We have completed filming for the NEW B.E.T. “Target Based” Self Defense System DVD “The only self defense lesson you will ever need!” How to survive a worst case scenario attack on yourself or your family. It is now off to editing which takes a long time to complete. The following clip includes raw and uncut footage from a 2nd camera that was there during the DVD shoot. Let me know what you think in the comments section. WARNING!!! Don’t ever do this, you will kill someone!!! Demonstrating a proper choke defense from against a wall featuring my B.E.T. Self Defense System. WARNING! Don’t ever do this, you could kill someone!!! This video is shows a part of my B.E.T. “Target Based” Self Defense System “The only self defense lesson you will ever need!” (How to survive a worst case scenario attack on yourself or your family). DVD Coming Soon!